Home » Blog » Want to Lose Weight? Sleep Better! Want to Lose Weight? Sleep Better! When it comes to losing weight we hear a lot about nutrition and exercise, but one critical component is often left out of the conversation: sleep. In 2010, scientists estimated that 1.5 billion of the world’s population was overweight and 500 million were clinically obese. It’s even worse in America, where it’s estimated that 75% of the U.S. population will be overweight or obese by 2020. The roots of these alarming statistics have been growing for a long time: easy access to high-calorie foods and increasingly sedentary lifestyles have led to an energy imbalance. It sounds simple enough — we’re taking in more energy than we’re expending — but there’s more to it. Poor sleep also plays a key role. Scientists have recently found that sleep loss leads to metabolic disturbances which increase this energy imbalance and result in weight gain. In fact, recent studies of healthy volunteers with normal weights show that even short periods of sleep deprivation lead to metabolic disturbances of sugars as well as increased appetites. Other studies show that abnormal sleep-wake cycles (like those related to shift workers) disrupt biological rhythms for sleeping, hunger and eating. When people don’t eat at their normal meal times (for example, eating at night), they gain weight. This kicks off a vicious circle, as excess weight is a cause of sleep apnea, which in turn leads to more sleep disruptions. 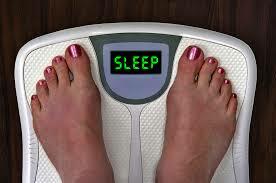 Sleep loss makes us gain weight, and gaining weight makes us lose sleep! How Will SleepRate Help You Lose Weight? If you’re trying to lose weight, sleeping better is one of the best places to start. You’ll have more energy for workouts, and your metabolism will operate more efficiently . Recent advances have made getting better sleep easy for everyone. Use SleepRate for a few days to identify sleep-wake patterns and to measure sleep duration, efficiency and structure. If the cause of poor sleep is Insomnia or environmental factors, SleepRate will provide you with, and guide you through a personalized plan to improve your sleep. Or, if those measurements suggest a condition that warrants further investigation, you’ll be prompted to consult a physician for an in-depth sleep evaluation. Learn more about SleepRate. Or, if you’re ready to purchase a SleepRate package, start here.